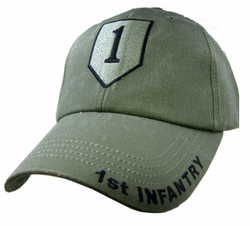 This US Army 1st Infantry Olive Drab Embroidered Ball Cap is directly embroidered onto a cotton twill cap with a sandwich trim. Fully adjustable embroidered strap. All of our Military hats are fully guaranteed.